Your living room area is where most of the action will be occurring. Whether you frequently invite guests over or if this is the place you and your family relax after a busy day, the living room is where you will spend most of your time. It is important that it is correctly lit and that the lighting reflects the mood that you want. 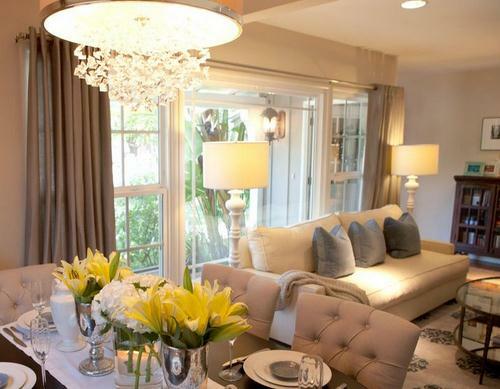 Aside from the general lighting, floor and table lamps can do a lot for a room. They can not only bring in an entirely different atmosphere, they can also reflect your personal style. Decide on what style you want. Are you looking for a sleek, modern feel or a rich, Victorian look? Do you want lamps with antique wood bases or silver aluminum? Take a look at your current décor and try to match that as best as you can. You will need to hone down your particular needs before you even start searching for the proper lamp. Do not just consider the base of the lamp, but also the shade. There are many variations from highly decorated shades to opaque and transparent ones. Going along with this, make sure you are choosing the correct light bulbs. Consider the mood that specific lamp is for and decide on whether you should buy ambient dimmer lighting or a bright, vibrant light. You will have to decide if you want a lamp that takes the center of attention when people walk you’re your home or subtle table lamps. Look at your current room and see if there already exists a center of attention. You do not want your lamp to overcrowd and take up space if you already have a lot going on in your living room. Small table lamps can be the perfect solution for this. The living room lighting should not be so permanently placed that you cannot change it easily. Fixed light, whether hanging or not, should be placed so that it does not create too many shadows on the rest of the room. Fixed lighting usually dominates the center of the room, so make sure you take the time to pick out a quality light. Lamps can often go unnoticed in the corner of the room, but they can still offer a lot with the ambient light they give off. Placing lighting at the corners and sides of the rooms provides your living room a relaxed, open space. On the other hand, if you have a particular lamp that you want to show off, you should put it in a place where it is visible to everyone who enters. Make sure the lamp coordinates with the rest of your furniture. Place sofas and chairs near lamps so that it creates proper lighting for reading or watching television. Since the living room is such a multi-tasking space, you want to ensure that there is the correct lighting for every activity.